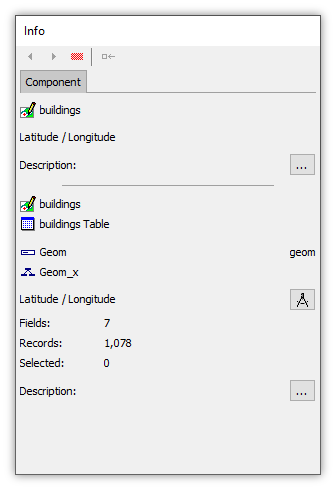 The Component panel of the Contents pane displays information for the active layer or window such as the projection (coordinate system) for the component. The Component panel is the default panel open when we first click on the Contents pane tab. If we have switched to a different panel in the Contents pane, we can switch to the Component panel by choosing it in the pull-down menu of panels. Open the Component panel in the Contents pane by pulling down the panel menu and choosing Component. A keyboard shortcut of Ctrl+1 also switches the Contents pane to the Component panel. 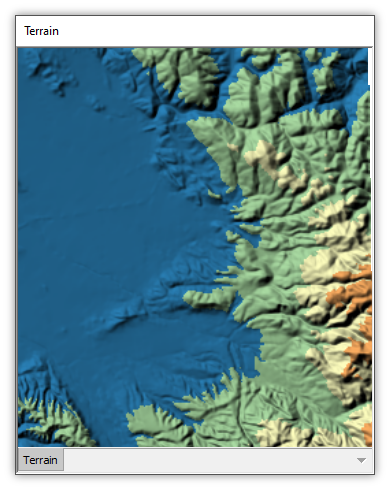 When a map has the focus the Component panel will report projection information for the map as well as for the active layer within that map. 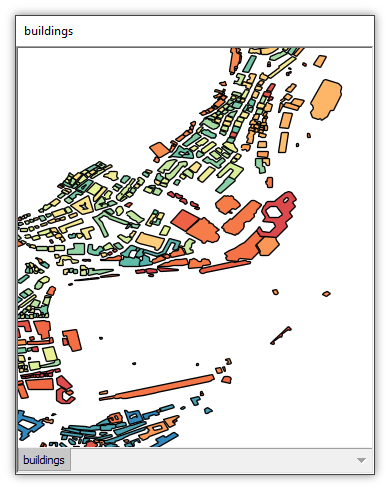 In the illustration below the buildings layer is the active layer in the map. The panel displays the active layer component, the table used by that component, the geometry field or tile field used, and the spatial index used. Coordinate systems are reported in black color text if the coordinate system has already been correctly assigned, or in red color text if the initial coordinate system has not yet been assigned. 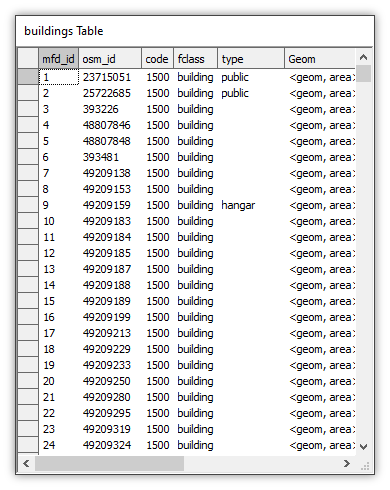 The records number reports the total number of records in the drawing (objects) or image (tiles). Tech tip: Clicking on any component shown in the Component display will highlight that component in the Project pane opening folders as necessary in the Project pane to show the component. When a drawing has the focus the Component panel will report projection information for the drawing as well as for the active layer within that drawing, if the drawing has more than one layer. Coordinate systems are reported in black color text if the coordinate system has already been correctly assigned, or in red color text if the initial coordinate system has not yet been assigned. 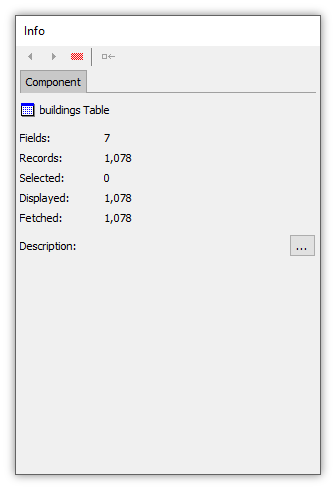 When a table has the focus the Component panel will report the number of records in the table. 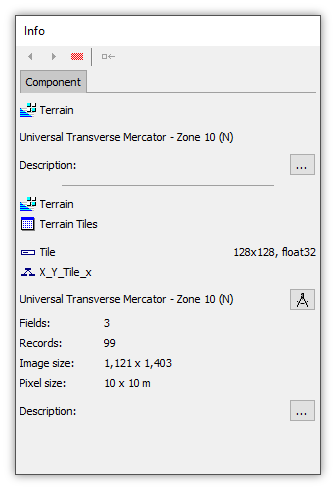 When an image has the focus the Component panel will report projection information for the image as well as for the active layer within that image, if the image has more than one layer. 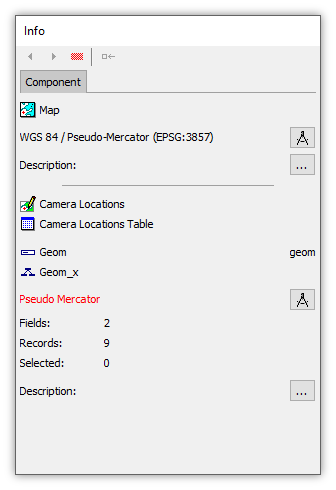 The Component panel tells us at a glance if a coordinate system needs to be assigned. When a data source specifies the coordinate system to use, Manifold displays the coordinate system in black color. If the coordinate system is shown in red color, we must click the coordinate system picker button and choose Assign Initial Coordinate System. Manifold shows the coordinate system in black color, as in the Latitude / Longitude coordinate system seen above at left, when the component has been created with coordinate system information or if it has been imported from a format that specifies the coordinate system to use. When a component has been created without specifying the coordinate system or it has been imported from a format that does not specify projection information, Manifold will show the default Pseudo Mercator coordinate system in red color. Red color warns us that we must assign an initial coordinate system using the Assign Initial Coordinate System dialog. Clicking on a component shown in the Component display will highlight that component in the Project pane opening folders as necessary in the Project pane to show the component. Example: Layers Tutorial - We take a tour of the Layers panel in the Contents pane, learning how to manage layer display order, select layers, turn several layers on and off at the same time, alter opacity settings for one or more layers and how to change background color. Example: Style Panel Quickstart - A tutorial introduction to using the Style panel in the Contents pane to apply color, symbology, size and rotation to areas, lines and points in drawings. Manifold Future - Future Tour Part 6 Cell Context Menu - A short video showing a fast and easy way to copy between cells in tables using the context menu. Also... one step undo of pending changes, setting the value of a cell to NULL and more. 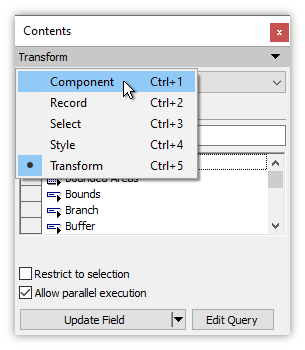 The context menu on cells is such a simple thing but it makes repetitive editing of tables much faster and easier. Manifold Future - 5 Minute Style Quickstart - A five minute, fast and easy introduction to the new Style and formatting capabilities in Manifold Future. In just five minutes learn how to rapidly change colors, symbology, sizes and rotations for area, line and point objects in drawings. Manifold Future - Example: Style Panel Quickstart - A video that repeats the Example: Style Panel Quickstart topic. The video shows how to format points using the Style panel, including simultaneous formatting of multiple style properties using the same thematic format setup. See how to use free meteorology symbols from a popular, free font, how to use letters and other symbols as point symbology and more. Manifold Future - Example: City Sizes by Population - A video that repeats the Example: Format the Size of City Points by Population topic. The video shows how to vary the sizes and colors of points in a map by the populations of cities those points represent, a classic example of thematic formatting. See also what the percentage numbers in the intervals list mean and how interval methods are automatically calculated by Manifold based on the data in the drawing.